This is an excerpt from Debbie Reese’s article “Critical Indigenous Literacies: Selecting and Using Children’s Books about Indigenous Peoples” in the July 2018 Language Arts. This article focuses on unlearning stereotypical representations of Indigenous peoples and replacing harmful narratives with accurate information and understandings. Teachers are critical in categorizing, selecting, and (re)presenting Indigenous communities through children’s literature. View the table of contents for the July Language Arts. Who benefits from this story? Whose voices are not being heard? While these may seem like difficult questions, Vasquez (2014) writes that even in early childhood, children are capable of asking these critical questions when approaching texts. Adding “Indigenous” to critical literacy asks readers to think of those questions when they read stories that have Indigenous characters in them. Critical Indigenous literacy forefronts the historically marginalized treatment of Native stories— and by extension, Native people. In addition, a critical literacies perspective gives voice to how stories are presented and told about people and their history. For example, our creation stories are just as sacred to us as Genesis is to Christians; we do not view them as folktales. When opening many library catalogs, however, The Story of the Milky Way: A Cherokee Tale by Joseph Bruchac and Gayle Ross (1995) is likely to appear under “Cherokee Indians—Folklore.” Beaver Steals Fire: A Salish Coyote Story by the staff of the Confederated Salish and Kootenai Tribe (2005) is most likely categorized as “Salish Indians—Folklore.” In fact, both are religious stories explaining some aspect of how the world was created. Whose voice is not heard in the way that stories are categorized? Whose ideologies are implicitly valued by categorical labels? Another problem is the “myths, legends, and folktales” books that are marketed as Native. They are ubiquitous and mostly written by people who are not, themselves, Native. These authors may not have the knowledge needed to accurately depict aspects of Native traditions, some of which are part of our religious dances. Who is telling these stories? How are these stories being represented? Who does this story belong to? Teachers can make choices that do justice to Native stories by choosing books written by Native writers. Both The Story of the Milky Way (Bruchac & Ross, 1995) and Beaver Steals Fire (Confederated Salish & Kootenai Tribes, 2005) are #OwnVoices stories—a hashtag created by Corinne Duyvis to describe a book that is written by someone who is of the particular culture being depicted. The idea is that the quality of a story is improved when the person creating that story is an insider who knows what to share and how to share it with outsiders. As a child, I was taught what can—and cannot—be shared with outsiders. A history of exploitation has made Native writers mindful of what they disclose. To capture this concept, I have been adding a “curtain” to Bishop’s (1990) “mirrors, windows, and sliding glass doors” metaphor when I talk or write about Native stories. This is a way to acknowledge and honor the stories behind the curtain—those that are purposefully kept within Native communities. Native communities resisted historical oppression and continue to preserve our culture by cultivating our ways in private spaces—behind the curtain. While Native people share some of our ways publicly in the present day, there is a great deal that we continue to protect from outsiders. Furthermore, it conveys the importance of how #OwnVoices knows what belongs within the community and what knowledge can be shared outside of our communities. 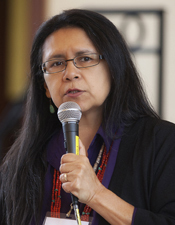 Tribally enrolled at Nambé Pueblo, Debbie Reese is a former schoolteacher and assistant professor at the University of Illinois at Urbana-Champaign. Her academic and professional articles as well as her blog (American Indians in Children’s Literature) are taught in English, education, and library science courses in the United States and Canada. She can be reached at dreese.nambe@gmail.com or on Twitter at @debreese. Photo courtesy of Della Nohl Photography. Nohl is Anishinabe, enrolled on White Earth Reservation.